This entry was posted in Cavacha, Congo by Moos. Bookmark the permalink. Thanks mate Papa Wemba was my idol thanks for his tribute can you upload more please. It’s been a bad few months for notable musical deaths, and now it’s Papa Wemba. The consolation is that he died while doing what he did so very well: giving us all so much wonderful pleasure. R.I.P. Papa. R.I.P Papa. His style was unique. No two songs had similar style or rhythm. This is an excellent album but it’s more an album of the singers of Viva La Musica than a Papa Wemba album. I hear Dindo Yogo, Emeneya, Esperant … but I don’t think Papa Wemba himself sung much on it. Viva La Musica those days (late 70s early 80s) was a fantastic band and recorded some of the most exciting Zairean/Congolese music ever. Chears Moos! Fabulous as always!! By the way, do you have anything from Camille Faruzi?? Thanks!! I wish I had Erik, maybe some fine day..
just a couple of songs on downloaded albums and shop cd’s. Oke, thanks anyway!! Enjoying the rest so much as usual!! 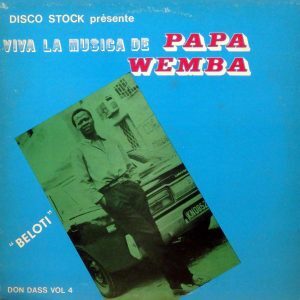 Thank you very much for this discover .Thank you soo much , for the LP PAPA WEMBA BELOTI P-VINE . -PAPA Wemba Kuru Yaka et l’orchestre Viva La Musica RYTHM MOLOKAI FLEUR BETOKO TIP 02 NIEKESE ! ELENGI HEIN !! If you can this stress to research this LP , it would a well intention .Thank you soo much for you comprehension . This is no jukebox !